A recent post on the New York Times “Lens” blog reminded me of a constant problem I encountered in Bamako: lots of people didn’t want to be in my photographs. I don’t mean they wouldn’t pose for portraits; people who knew me were glad to do so, and often requested it of me. I’m talking about strangers on the street, or in other public places, who objected to my taking a picture that might show them, even in passing. In the U.S., most of us have some minimal expectation of privacy when we’re in private spaces–homes in particular, and businesses to a lesser degree. If somebody wants to take a photo of you in such a space, they ought to ask you first. The same rule applies in Bamako. For instance, after ducking into a market stall in Magnambougou to watch young men beating starch into bazin cloth, I asked if I could shoot them, and they agreed (see right). In public spaces, however, that expectation vanishes. When you’re walking down the street, driving in traffic, or eating an ice cream cone at a sporting event, anyone can snap your picture, for any reason. But for many Bamakois, the expectation of privacy extends into public spaces. I can’t count how many times I’ve been verbally challenged by some passer-by after pointing my camera at a monument, building or street scene. “Don’t photograph me!” they shout, as if my sole purpose for being there is getting a candid shot of them. I’d have gone to the cops in that case, I said. “They’d just tell you that you were in the wrong,” he responded, and his friends nodded in agreement. I’m pretty sure they’re mistaken, but in Bamako it doesn’t matter so much what the law actually says. Okay, even if I did take your photograph, I asked, what’s the problem with that? “You’d take my picture to your country and show it to people,” he said. Well yes, I thought, that’s rather the point of photography, and after offering an apology (which he did not accept) I went on my way, assuming that my interlocutor was just being a douche-bag. And he probably was. But later it dawned on me: sutura. See that guy shaking his finger at you? A few weeks later I was on the King Fahd Bridge and saw some fishermen in their narrow canoes, called pirogues, in the Niger River down below. I got out my Lumix and shot. It was only later, when I reviewed the images on my computer at home, that I could see one of the fishermen shaking his finger at me. “Don’t take my picture,” he was signaling. Even in that very public setting, he was concerned about preserving his privacy. As you can see, I don’t feel always obligated to honor people’s desire for sutura. In this case, you can’t make out the guy’s face anyhow. But after several such encounters I began to wonder: How do other people shoot images in Bamako’s public spaces? I asked three professionals about this — an American photographer (female), an American videographer (male), and a videographer from Burkina Faso (male), all of whom had worked extensively in Bamako. And they all had the same approach: Whatever objections someone may have to being photographed or filmed in a public place, just ignore them, as politely as possible. Find a new angle and carry on. That’s an option. As an anthropologist I should be sensitive to the concerns of the people I study. But I also can’t accept the burden, before shooting in a market or on a street, of asking permission from anyone who might wander into the frame; that would render public photography impossible. There are, of course, certain things at which you should never point your camera in Bamako. Any government building, any person in uniform, and any embassy (especially the U.S. Embassy!) is off-limits. In January, one of my Lehigh students learned this the hard way after taking some pictures of the lovely landscaping outside the U.S. Embassy. But that’s nothing specific to Mali, it’s true in many places. The post on the Lens blog suggests that taking pictures in public places has been getting more difficult in the U.S. lately. It’s still lawful to do so, but you’re more likely to get a hard time these days photographing certain people, especially police and security guards. But most normal Americans don’t expect to have privacy when they go out in public. 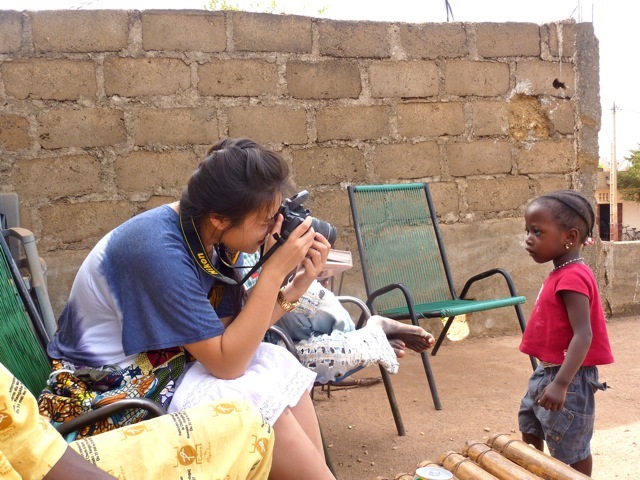 In Mali, it’s often been the case that the person with the camera is a (white) foreigner, while the person being photographed is a (black) local. But that’s changing along with technology. One day while walking through the Badalabougou market, I noticed a kid of perhaps 14 walking in my direction, holding his cell phone in front of him and staring at it intently. As he drew near, holding up his phone right in front of me, I heard a telltale artificial shutter-click sound. I’d just been photographed, and without my permission. That’s okay, I thought. Turnabout is fair play. This entry was posted in Uncategorized and tagged bamako, photography. Bookmark the permalink. Very interesting article as usual. There is however one element you haven’t talked about. I’m mixed Malian and throughout my traveling around the country, I was often told by locals that people used to take pictures of them and these pictures would eventually appear in magazines, articles, even books, without their permission. I can’t recall the name of it, but I believe an old French photography book ended up in the hands of some Dogon people and they were outraged by the fact that they appeared in it and this book was actually being sold. They told me they felt that if the photographer gets money, they should as well and most importantly, as you mentioned, their Sabati was not respected. I’ve very often been asked for money to take pictures of people. I think people don’t want to give anything for free anymore. For instance a friend doing a photography project in Bamako a few years ago would be asked to buy a fruit to be able to photograph a fruit stand. Similarly, she would need to buy a cup of coffee to take pictures of those breakfast tables. Finally, let’s say the truth; a lot of Malians like to keep their activities quiet and discreet. If you take pictures, they’ll never know where they are going to end up. Three years ago, a picture was taken by Essor at an intersection illustrating an article on traffic. My car was right in the middle of the picture. I can’t tell you the number of people that called me and jokingly told me “you go out so much around town that we saw your car in the news”! And don’t EVER take a photo of the Bamako airport. I was detained 3 hours and had my film confiscated. Hi Bruce, It was good to hear from you again! Unfortunately that suspicion hasn’t abated with time. Two months before the coup, a group of American students I was traveling with was stopped by gendarmes because one of its members had allegedly taken a photograph of the Markala dam. Never mind that you can find pics of the dam all over the web! They checked her camera and didn’t find anything, but only let us go after several minutes of tense exchange. The year we arrived in Mali (1988) was the first that a paid permit was not required for taking ANY pictures in the country. Restrictive approaches tend to have a long half-life in people’s attitudes, especially in a change-resistant culture. In a small arrondissement, I took a picture of a monument in the square not far from a government building. My camera was taken and the film exposed to delete the picture. The same roll had the only pictures if our newborn’s birth. Needless to say, that hurt, and still does. 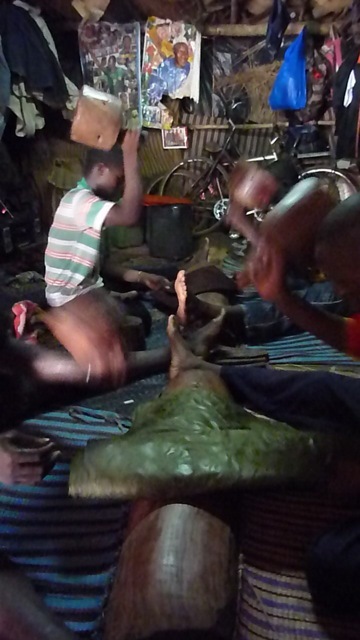 In dogon country, a while back, a picture of an individual could be used in sorcery to harm that individual. This was the main objection. Today the reason is usually economic in nature. I think that being a man or a woman makes already a difference if you are taking photos. My friends tell me that it is my “female charm” that makes people open up to me. My speciality is portraits and I learned that most of the time a big smile helps to disarm the potential “target”. I live in Bamako and I must admit that I have more chance to get the permission to take photos of men than of women in Mali (it would be just the opposite in some countries). But rarely I’m refused if I put my camera aside, if I take the time to talk to them, explain who I am and make them feel that I’m interested in them and their lives. I also try to give them their developed photo afterwards. And again, if somebody gets angry because he might be on a photo that I took while taking a photo of a street scene, excusing myself in an affable manner with a smile and giving them a compliment about their beautiful boubou etc helps most of the time… if they speak French, but a positive, open attitude helps in any case. And yes, most of the time the payment is an issue but I always make them understand that I will not give them money. Although, taking photos in Mali is very rewarding, it is also very energy and time consuming, I admit. PS. I really enjoy reading your articles, please keep posting them. Your story reminds me of a time when I was taking a still photo of a Guinean merchant friend of mine–at his invitation–at his stall in Brazzaville’s Moungali market. The next thing I knew, I was accosted by someone claiming to be a local official, demanding to know why I was “filming the market.” My protestations that I was merely shooting a portrait, by request, did not convince him. A second fellow I’d never seen before soon showed up to denounce me: “He’s been filming the market! I saw him!” (I was barely able to keep from asking the obvious question, “What’s wrong with filming a market anyhow?” And Congo required no permit, officially.) Ultimately, with my friend’s support, I was let off with a warning. I generally found Congolese to be much more sensitive about photography than Malians. Thanks for the tip, Bruce. I’ll keep your post in mind. I’m leaving for Mali in two weeks. Wish me luck. Good luck, Steve! Allah ka taa ni segin nogoya. K’an b’u fo. Bonne chance, Steve. Stay out of Tomboctou! il n’y a pas hélas une grande culture de l’image chez les gens. L’éducation à l’image, aux arts, doit être une des tâches prioritaires en matière de politiques culturelles en Afrique! Le modèle élitiste d’organisation évènementielle de type Biennale de la Photo où se donnent rendez-vous Artistes, Curators, galeristes, collectionneurs, intellectuels et autres bourgeois locaux a toujours eu un impact riquiqui auprès des mentalités populaires en Afrique. Les gens se préoccupent plus de leur survie quotidienne et courent plus derrière un sac de riz que derrière une oeuvre d’art. Les gens ne s’attardent pas beaucoup devant une image à Bamako. Un artiste qu’il soit photographe, peintre.. est considéré implicitement par les gens comme un fainéant. A Ouagadougou, j’ai failli être cogné en 2006 par un gars parce que je l’avais filmé , lui et ses amis. Il voulait que je lui file soit ma montre ou un peu de tunes en spéculant sur le fait que j’allais tirer une fortune avec les images que j’avais prises d’eux! A Bamako dans un maquis même scénario en plus violent encore pour juste deux ou trois photos d’un concours de beuverie! During my one year stay in Douentza, for anthropologic research of the market and the commercants, I did not even bring my camera with me the first 6 months. Thank you for your article, it is very important to me. So many beautiful images every day to shoot, but I was ashamed to bring my fotomachine. As my worn out simple black bag was considered already as the container of the money making machine, or the beholder of thousands of banknotes. I was the only white around. I was doing research so I was asking questions. Asking questions is already brutal and impolite. So a camera (that privacy-depriving thing that only people with money can afford, and what for, who in Douentza can understand that it is nice to have some memory of people, smiles, situations, landscape, on image?! They have their own head and memory. They never lived with pictures. Let alone that they can never afford to come to Europe and snapshot us to talk about in their village. Our country does not even let them in even íf they have money. So to them photography is curiousity, brutality in a way, for people that can afford. No normal Malian would take pictures of the daily life in Douentza unless they were valuable for a commercial reason. And if you are integrated, pictures can be dangerous for black magic reasons. When finally after months I could portrait the (cattle)market, it was only with a friend from Douentza who introduced me everywhere and explained that my photomachine would not make pictures to be used for magic or to be sold or to show off with in my country. And still, he had to persuade me to really ‘click’! Now, thanks to your article, I realise I was not a coward/ but sensitive as I should be. Many months later, together with friends and never alone, I could make snapshots of the people that were already like friends. I realize now it was kind of a gift from them. But I remember the shame of one poor young lady with her child who was so beautiful that I photographed her out of the shop of a befriended commercant (my alibi). Now when I see the photo I made I still see why, and the beauty of her and her child, but I am too ashamed myself and will not show it to no one, never. Respect, even though she will never know that. I have been staying in the most photogenic area in the world (in my view) and I came home without too many photographs. I am grateful now. My memory is in me. The people in Douentza generally also manage to live like that. And why do we always have to snapshot everything and every other experience and beautiful people or views? And could they do the same in our countries?. I start to understand the Muslim (also Christian originally) idea to be aware and careful with images. Most Malinese are Moslim, that also. Malien people are very spiritual and religious. Muslim, or other. I would not say it is a merely economic thing. If you want to photograph a coffeeseller for example it is just normal to buy a coffee and have a chat and then ask eventually if you can maybe take a picture, then the picture has a context!. That is no commercial question. That is a matter of respect they are asking. And the money of course they can use it. Just coming to Mali, by means of enough money and visa available for us, photographing people as we like, is like a colonisation of the spirit. Worse than the previous way. I understand and respect if people in Mali reject that. Go there if you can and look with your eyes and your soul. Be modest, you are a guest. So: to shoot or not to shoot: my answer is not to shoot. But for governemental playgrounds I would say: go for it. That is for your own risk. And thank you Bruce for this subject, interesting like always! This has been a real interesting and informative conversation. Thanks. I neglected to mention the spiritual dimensions of this topic in my post: there are some Malians who shun photography either because (a) they believe it can do spiritual harm, or (b) they believe Islam forbids it. The latter tend to fall into the conservative/reformist/”Wahhabi” category of Muslims, and they are rather rare from my experience. But the former are not uncommon, and can fall into “traditionalist”/”animist” as well as Muslim categories. In any case I agree with Mariam and Tatiana that economic factors are key, probably more than religious belief, in shaping Bamakois’ reluctance to be photographed. I took pictures in the era that Polaroid cameeras still existed. I used to offer one polaroid picture as an exchange for a portrait taken by a decent camera. Alas, Polaroid disappeared. Thanks for sharing this. I beg to differ with your view that while taking pictures of strangers in public places in the US the public/private divide vanishes. Strangers don’t come in close proximity to me with large cameras in the US to take my picture and when foreigners do ask to have their picture with me, which is rare, they always ask and it is always strange at first and uncomfortable since it does not happen often. While living in Mali I took thousands of pictures. Most are of people from the village where I spent my first two years near San and many others are of landscapes, people and things from my travels around the country. Living in Bamako taught me the other side of the coin as many more people had access to cameras and phones with video/picture capabilities. I always felt my privacy was being invaded when someone took a picture or video of me for the exact reasons you mention – what are they going to do with these images later? Tatiana, it is also harsh to say “who in Douentza can understand that it is nice to have some memory of people, smiles, situations, landscape, on image? !” Most of the Malians I know treasure photographs since it is such a luxury item and a precious way to memorialize a special event. And, unfortunately, photography in Mali is often one sided. The expat takes pictures – souvenirs from an incredible journey – and what is the subject left with? The feeling of being used. While I think it is easy to rationalize public photography with the fact that you might be a sensitive, aware photographer – the truth is, most people are not and the assumption is that you are like the rest – for better or for worse. Bruce, you – and your commenters – give a lot of food for thought here and I’m thankful you’re keeping up the posting. I hope you and your family are re-adjusting well to life in the US! A different perspective. Those of us who are from there vs. those who are considered strangers. What you perceive is considerably different that what we perceive. Where you are denied, I am welcomed. So is it actually the photo and it’s calculated worth that makes the difference? I think not. It has more to do with who is wielding the apparatus and the attitude of the photographer. I am seldom denied, more often encouraged. The few times I have been denied in 50 years, and I can count them on the fingers of one hand, I simply move on after a brief apology. An understanding of the culture and knowing better of where and when can make a world of difference. Jennifer, my problem in BKO never concerns pictures of strangers–it concerns pictures (or video) of places, scenes, buildings etc. I don’t think anyone trying to take a photo of the US Capitol Building, or Times Square, would encounter objections from anyone who might happen to appear in the frame. Correct me if I’m wrong, but I’d say there’s a meaningful distinction between taking photos of public places, and taking photos of people in public places. In response to Sagou’s comments, I think the identity of the person with the camera matters a lot, but even African photographers and videographers I’ve met run into this resistance. Most definitely, but less so than with tourists and some ex pats who have not learned the “when and where”. Living in the country will/should instill a certain amount of sensitivity. Unfortunately, it doesn’t happen for some photogs who have to “get the shot” despite all else. Those who come from the US or Europe have no knowledge of what is accepted because of the freedom to shoot anything, anywhere back home. Some who grew up in this country don’t care. Having grown up in “la brousse”, I ran into a couple problems in the city, but I learned quickly and it never happened again. Hi Jennifer, I completely agree with you. And Sagou Dolo under your comment. As my English is bad and my reaction had multiple angles, that sentence ‘ who in Douentza can understand that it is nice to have some memory of people, smiles, situations, landscape, on image?’ was clumsy. I meant it in another way, other context. I agree with you that photographs are treasured and very much appreciated by most people. But it is another thing if they are not sure if that images will or could be used ‘against’ them, or not in their favour or interest (which is not a strange thought, considering their experiences with foreigners). I shared all the pictures I made and they are indeed treasured along with the other photo’s in the house. What I meant with that phrase you mentioned: when you where born and live somewhere, like me too when I lived in my village, things around you are simple daily life, not worth photographing, I would not have understood it for example if foreigners came to my village and take pictures of all the things (not to speak about the villagers!, me?!) that were so normal and even a bore to me. I have no photo’s of my village for instance. (only now that I left I recognize the beauty.) If we had some tower, building, monument, or folklore known to be special, ok. But it was all trees, cows, farms and farmers, and I could not see what was so special about that, On the contrary. If they would have come with a camera in front of my nose, of the neighbours, I would have been mad. Shocked. Even if camera’s are normal and affordable for us. As Douentza was no touristic village in that time most people were not used to foreigners loving (images! of) dry hot sand, empty trees, heards and cattle, mud houses and mosks, sheeps tied down on the bus, etc. What would be so special about that? They imagined foreigners would want to make pictures of masks, artisanat and jewelry, and they would show you exactly what is beautiful for your picture. Touareg and Peul that are used to travel around even came to pose spontaniously in full outfit when they saw I had a camera., as a geste of favour. No money asked, only a joke and a smile. I was specially invited to take photo’s of big fat bulls, or full shops, or loaded trucks or healthy cattle. But making snapshots of daily life, of people without posing for it, that was bizar. If not, suspicious. 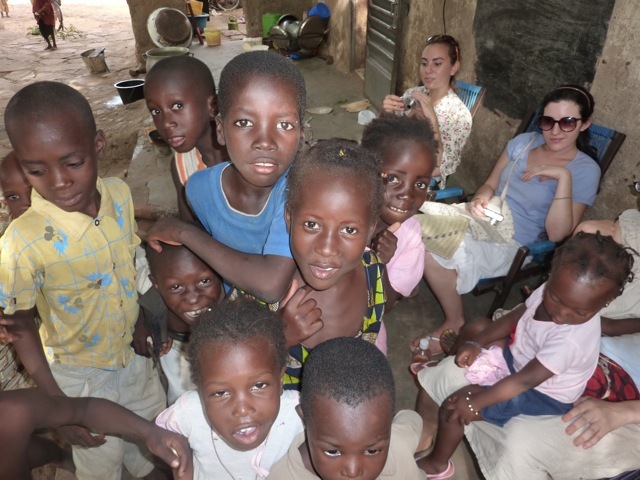 Of course there were also people happy, shy or not, to be photographed, And children all the time! People I knew, or their friends or relatives also. As long as I was no foreigner to them. Or while showing respect and modesty. But as a foreigner just like that taking pictures of daily life, without any introduction, would not be appreciated or understood, in general. They would ask if I wanted to show off in my country with their poverty? Or would I sell them to a calender or magazine? Or as I was living there and sometimes not considered an outsider, would I bring that image to be used for magic? And many other reasons like religious or economic ones. Still clumsly written but hopefully understandable. For the rest I agree with Sagou Dolo under! I agree with Jennifer 100% and disagree with you Bruce that there is really any difference at all between the attitudes of Americans (and most anyone else) and Malians with regard to taking pictures in the public space. Where in the US could one shoot photos of complete strangers, even at a distance, without eliciting anger, and, yes ire. The merchant in Dibida in front of his stall and the mechanic in front of the Midas muffler shop here would react similarly I think to having his photo or his establishment’s photo taken:suspicion, perplexity, even fear. I agree this was a rich discussion but think that much of the thinking about photography in Mali in the public domain was framed in a sense of Mali as the exotic, of an experience to be documented. As Jennifer put it, a one-sided transaction. Though you say, below that you rarely take photos of strangers in public, your photo of the Bozo fishermen in the pirogue is an example precisely of that–and it drew precisely the response one would expect. With the exception of facilities/buildings considered in Mali to have national security sensitivities–the Palais Presidential, the Airport, I never experienced any unusual interdiction or taboo against taking photos of public buildings, as you suggest below. And I agree with Dolo when he says that with some human interaction and joking, even photos of strangers and their homes and properties can sometimes be negotiated in public. It is the non-negotiated taking of photos in public that is objectionable. I see where you’re coming from, Ibrahim, but I’m still unconvinced. The Bozo fisherman is one example where your explanation makes sense, but should I point my camera at some monument in Bamako, Malian bystanders who happen to be in the frame frequently object, even though the obvious reason for the photo is the monument, not them. I don’t think you would encounter similar responses in public places in the US. It surprises me how often you, presumably a student of anthropology, draw sweeping and simplistic conclusions about culture. Your laughable “sutura” explanation is only the latest in your attempts to comprehend Mali in neat, pithy, often illogical, packets. It is as though you write not for an enlightened audience, but for the hoped-for gaze of an American newspaper editor — the more ignorant about francaphone Africa, but desperate for copy in English, any copy, the better. I expect better analysis from an anthropologist. If you’d like to offer your own analysis or critique, you’re welcome to post it here. That’s what the blog is for! I have nothing against being neat or pithy, by the way, but if there’s anything illogical in these pages perhaps you could direct readers’ attention to it specifically. Felicitations for being so polite to such an unpleasant respondent as Mr. R.U. (Un)Educated. That is very interesting what you say. Could you explain what is illogical? I have been reading questions and suggestions so far. More open, respectful and insightful than elsewhere in the media about Mali, and everyone can react (indeed, if they know English.) The reactions come from all around and deepen the view. I did not see conclusions yet, But maybe I overlooked something? Could you tell what is bothering you? PS this is not sarcastic. Don’t be very much concerned. This person RU is a little bit out of touch with reality. Wees niet erg bezorgd. Deze persoon is RU een beetje het contact met de werkelijkheid. I was taking video of the Bamako Grand Marche and Artisanat from a taxi that was slowed to a stop in traffic. A passerby reached into the car and tried to take the camera out of my hands shouting “donne-moi ca! donne-moi ca!”. Scary, and I still have the footage. Great thought-provoking post!! I agree that there is a huge difference between taking a stranger’s picture (up-close) without permission and taking a picture of a building or monument that happens to have people standing in front of it. In my opinion, part of the reason Malian people don’t want their pictures taken is because they don’t have any control over how it is going to be used, and if it is used, it will probably be without their knowledge. As far as I know, no NGO is out there asking Malian people permission or giving them compensation when using photos of them in brochures, websites, etc. And those pictures don’t tell the whole story. Even my own step-daughter (Malian), has times when she looks like she should be put on the fly-in-the-eye-poor-African-child brochure (usually after playing in the sand). And I can’t imagine how I would feel if someone took a picture of her and her friends outside and later used it in that way. If you happen to get into somebody’s picture of an American landmark, there is very little worry about that picture being published or used for something other than private/family viewing. But if you (as a Malian), happen to get into somebody’s (foreigner) picture in Bamako, you might just end up in promotional materials or an art show. A photo tip to everyone from a professional. Anytime you are in the unknown zone, never hold a camera in front of your face. Set your a/s or program mode, use a wide lens and carry the camera at your side with your finger on the trigger. No one will ever know you are shooting. I have never been caught while doing this and have been shooting in Mali since 1957. Hello Bruce. I’ve been in Bamako for a month now. My research is going well. But I took your advice, and I have been exercizing caution when taking photographs, especially in public. I always try to get permission from someone. I’ve gotten some nice shots nonetheless. I posted several of them on my blog. Oh yes, I started a blog, partly as a result of your suggestion and with a lot of help from my girlfriend Olive. I’m using wordpress, but not the professional version. My blog seems amateurish compared to yours, but I have posted some interesting observations and some nice photos on it. You can check it out at gone2mali.wordpress.com. I’d be interested to have your input. I am keeping it completely separate from my research, for now anyway, and just commenting on interesting aspects of life in Bamako and some interesting things that have happened to me since I’ve been here. Back to photograph taking, I’ve had no unpleasant experiences yet, probably because I’m being over cautious. I did take some shots of public monuments. My friend and driver assured me there would be no problem. But I usually didn’t hang around long after snapping the shots. Of course I’ve gotten lots of really nice shots of friends and people I know. And when I shop in the stalls and markets I often ask after buying something if I may take a shot. No one has objected so far. I may get a little more daring when it gets near my time to leave Mali in mid December. But until then, I’m heeding your advice carefully so as not to injure anyone’s sabati. I appreciate your photography tip and all your advice and encouragement as I was preparing for my trip. Please have a look at my blog and let me know what you think. Bruce, I’m glad you got a look at my blog. It’s my first effort ever. I’m pleased with it, but I’m not getting many replies. In time, I guess. Things are calm in Bko. People are going about their business. There was one warning a couple of Friday’s ago from the Embassy for Americans to stay home or go out cautiously for fear that resentment over the anti-Islam film trailer might boil over into violent demonstrations. That didn’t happen. Hardly anybody mentioned it. I think they are more mad at the French because of some cartoons published recently in a Paris hebdo. There have been some demonstrations demanding that the government do something about the occupation of the north by Islamists. But the US is not the bad guy in that one. People talk about some sort of international intervention, but it doesn’t seem likely in the near future. Just wanted to say thanks for a superb blog Bruce! You were right, (above), that my son Murray has been a photographer–(He was a professional photographer in Canada for twenty years–and also his birthday is August 15th! Tell me–how did you know both these things? Just read an interview with Wim Wenders: “To shoot pictures” is always an aggressive act and I fully understand all persons who don’ want to be fotografed. He preferes photographs without people, but only the human traces in the sceneries. This remebmers me of an experience in my childhood in the seventies (I grew up in a small town in Tirol, Austria), I was about 11,12 years old. We, some classmates, were on our way back home from school. In front of the gothic church we saw a strange looking young man with a camera, Japanese probably, we stopped and started to watch what he was doing. After a while he approached us, smiled and said something in English, we did not answer, started giggling, stepped back but continued staring at him. It was not the first time to see a foreinger nor a camera, nevertheless we were attracted and frightened at the same time. He took his camera and wanted to take a picture of us and we ran away. i remeber well that we were afraid what he would do with that picture, maybe even our parents would get to know that we had spoken to a foreigner. In a certain way we also wanted to protect our “sabati”, I would say after having read your post. Thanks for this post, Bruce! I had to be careful about taking pictures in Bamako too. It’s good to know a little more about why. I do find it funny though that Malians had NO problem following me around with their cameras and phones and taking videos and pictures of me! It took me a while to get used to that. Compare this shot of a Bozo fisherman with the one above. Big difference in attitude. A little interaction will get you a big smile…and a great shot.